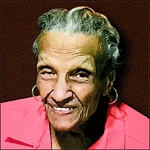 Obituary for Ruth Whitted Turner | McGuire Funeral Service, Inc.
Ruth Whitted Turner, 97, peacefully transitioned into eternal rest. She was preceded in death by her husband, Rodman L. Turner, Sr., and son, Rodman L. Turner, Jr.
Ruth was the devoted and loving mother of Gertrude Turner Wills and William Whitted Turner (Sidnice). She is also survived by seven grandchildren, four great-grandchildren, many dear nieces and nephews and a host of cousins and friends.